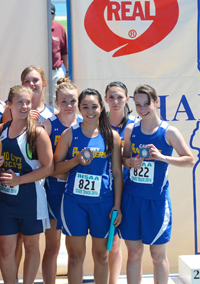 It was a hot weekend in the Treasure Valley for the 97th annual Idaho High School Track and Field Championships staged by the Idaho High School Activities Association and, for the 30th year, by United Dairymen of Idaho. Certainly the competition proved a little too hot to handle at two locations for the 27 athletes competing at state track from Hailey’s Wood River High School, Carey High School, Camas County of Fairfield and the Community School of Sun Valley. The eight Wood River Wolverine state qualifiers managed just 12 team points during the State 4A competition Friday and Saturday at Boise’s new facility Dona Larsen Park. At Middleton High, the 13 Carey School athletes settled for 12 points and the five Camas entrants had 13 points at the same State 1A meet. Thousands of track fans, parents and friends enjoyed the competition featuring such prep stars as Challis junior sprinter Hannah Cain, who swept the 1A girls’ sprints; Pocatello junior Elijah Armstrong, who swept the 4A boys’ distances setting overall state records in the 3200m and 1600mk; and Boise High junior Emily Hamlin, who swept the 5A girls’ distances with state records in the 800m and 1600m. Among area athletes: Camas junior Isaac Simon placed second in 1A high jump in 6-0. Carey sophomore Joe Parke was fourth in the same event at 5-10. Wood River sophomore Sara Lichtenberg finished fourth in 4A high jump at 5-0. Hailey senior Janel Passey placed fifth in the 4A 1600-meter run with a 5:22.78 time. A Wood River distance star, junior Alexis Gonzalez, ran sick in 3200m and 1600m and his coaches pulled him out of the 800m final. Finishing sixth for Carey in the 1A 4x100m and 4x200m girls’ relays—both in season-best times—were Daphne Kirkland, Clarissa Kirkland, Arrianna Neilson and Kelsey Barker at 54.15 seconds in the one-lap relay, and Lilly Rivera, Neilson, Medin Cenarrusa and Barker at 1:55.51 in 4x200m. Wood River: 7—Kenya Schott 12:01.48 in 3200m. 8—Sara Lichtenberg 1:05.08 in 400m. 10—Mariah Stout 5:31.44 in 1600m. 11—Janel Passey 2:28.85 in 800m and Kenya Schott 5:32.37 in 1600m. 12—Kenya Schott 2:30.53 in 800m and Mariah Stout 12:23.89 in 3200m. 14—Alexis Gonzalez 10:33.99 in 3200m and Taylor Douthit 118-1 discus. 16—Alexis Gonzalez 4:48.87 in 1600m. Preliminaries: Michelle Mason 10th 100m in 13.02 and 11th 200m in 27.07; and Kyle Mungal 14th 400m dash in 54.46. Lichtenberg ran a 1:01.94 preliminary in the 400m. Carey School: 7—4x400m boys relay in 3:47.30. 9—Kelsey Barker 1:03.34 in 400m prelims and Matt Whitworth 121-2 discus. 11—Medin Cenarrusa 18.02 and 53.79 in 100m high hurdles and 300m intermediate hurdles prelims, and Luis Garcia 18-5.5 long jump. Camas County: 4—Isaac Simon 40-10.75 triple jump. 9—Jessica Lanier 97-7 discus and Hunter Rasmussen 30-10 triple jump. 10—Taylor Gorringe 96-3 discus. 11—Ariel Reedy 95-6 discus and Taylor Gorringe 31-10 shotput. Community School: 12—Ava Mazzoni 1600m in 6:25.93. 5A—The Mountain View girls won their third title in four years 91-80 over Rocky Mountain; and the Rocky Mountain boys captured their fourth straight title 119 to 83.5 over Lake City. 4A—With 28 points relays and 30 points sprints, Rigby’s girls took their second straight title and fifth in eight years 131.5 to 111 over Bishop Kelly; and the Skyview boys from Nampa prevailed 77.33 to 57 over Moscow for their first-ever title. 3A—Sugar-Salem of Sugar City won its third consecutive girls’ title and fourth in five years 74.5 to 67 over Payette; and the Sugar-Salem boys slipped past Weiser 87-85 for their second straight 3A crown. 2A—Nampa Christian’s girls won by the narrowest margin 72 to 71.5 over Firth for their first state title since a run of seven straight from 2005-11; and the Declo boys won for the first time since 2000 and third overall 82-74 over Melba. 1A—Liberty Charter’s girls out-pointed Challis 62-57 for their second title and first since 2010; and the Lighthouse Christian boys earned their first state track championship 72-61 over Logos (Moscow).